Mosquitoes may have a reputation for being one of the world's most intractable pests, but they're actually quite tiny and fragile. So when an international team of scientists, including several at Virginia Tech, wanted to observe the underlying mechanisms of how the insects feed, they had to get creative. The researchers would trap wild mosquitoes in the forest edging the Advanced Photon Source in the Argonne National Laboratory outside of Chicago, then essentially starve the insects for 48 hours. After anesthetizing them with nitrogen gas, the team used nail polish to glue a single mosquito to the head of an insect pin, and then submerged its proboscis – that long, straw-like appendage mosquitoes use for drinking – into a sugar-based feeding solution. As the hungry insect sucked up the nectar, live synchrotron x-ray videos captured footage of everything that happened behind its opaque exoskeleton. These efforts, published in Scientific Reports, not only yielded the discovery of a new mode of drinking in mosquitoes, but they could also answer a fundamental question of insect morphology: Why do some insects that drink liquid have two pumps in their heads, while others have only one? 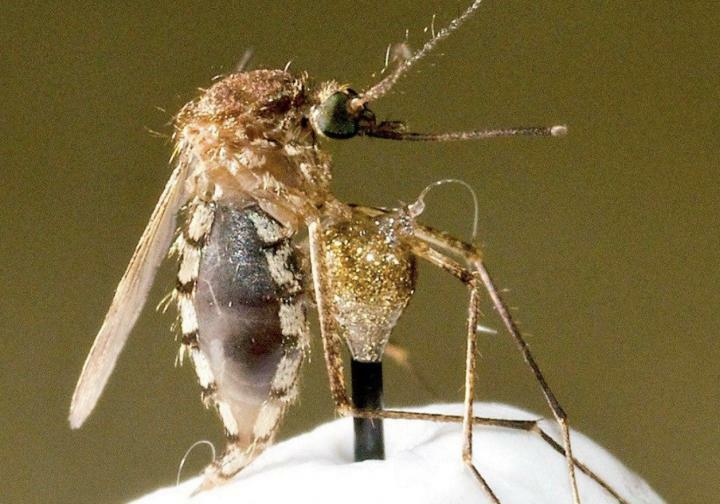 "We found that these two pumps in the mosquito's head allow for a secondary 'burst mode' of feeding," said Jake Socha, associate professor in the department of biomedical engineering and mechanics at Virginia Tech and a senior author of the study. "This burst mode involves a single, large-volume intake of fluid, which is something that had never been observed before. It potentially gives an insect with two pumps more options and allows for multi-modal feeding, as well as functional flexibility." Due to the 2016 Zika virus outbreak and a new epidemic of yellow fever currently sweeping through Brazil, mosquitoes and the diseases they carry remain an ongoing focus of public health concern. These new findings on the insect's feeding mechanisms and modalities could have larger implications for how scientists address mosquito-borne disease transmission in future research. "Mosquitoes are not just a nuisance, but also a health threat," said Mark Stremler, a study co-author and professor in the department of biomedical engineering and mechanics. "The more we can understand about their robustness and how they survive, the better chance we have of figuring out ways to control them." Despite the importance of feeding in mosquitoes, previous research has not fully understood the internal mechanics of the mosquito's two-pump system. In bouts of normal drinking, these two muscular pumps operate in a pattern of continuous reciprocation with multiple small strokes, like a back-and-forth motion of small sips on a straw. However, in the newly discovered burst mode, a mosquito takes a single, large-volume stroke – a giant gulp through the straw – during which the two pumps expand massively to what appears to be their maximum volume. This burst mode produces a large, quick influx of fluid, but it's also far more energetically costly than the normal continuous mode of pumping. "The burst mode creates this big expansion in volume, producing a flow rate that's up to 27 times greater than what we see in the continuous pumping mode," said Socha. "But it takes about 1,000 times more energy. So that begs the question, why do mosquitoes even use it at all?" To explore that question, the researchers developed a mathematical model of the mosquito's fluid pumping system, which gave them a detailed mechanical understanding of how it works. They found the burst mode allows mosquitoes to generate a low-pressure vacuum on demand, which the insects could then use to drive an obstruction – like an air bubble or a small particle, for example – up through the proboscis. The temporary boost in volume intake could also be used for faster drinking, perhaps if the mosquito were trying to avoid detection, but that scenario seems less likely because the bursts were only observed sporadically. "The fluid mechanics model allowed us to postulate new hypotheses about what this burst mode might do instead of just saying that it exists," said Stremler. "Now we have a parametric description that gives a basis for deliberately testing questions of potential function. Overall, the model helps direct and inform the possibilities of where we go from here with the research." In addition to the biomedical implications of mosquito-borne disease transmission, the researchers also envision the possibility of mimicking the mosquito's two-pump system in a microfluidic device that could be used to deliver targeted drug therapy within the human body. "For these types of tiny devices, you might never have stumbled upon that functional design unless it's something you can see in nature," said Socha. "Evolution is the ultimate tinkerer." With a number of hypotheses remaining, avenues for future research look promising. "As opposed to closing an open question, this study has instead opened the door to a whole new set of questions and possibilities that we didn't even consider before this burst mode was observed," said Stremler. This research was funded in part by the National Science Foundation and the Virginia Tech Institute for Critical Technology and Applied Science. Additional co-authors include Osamu Mochizuki of Toyo University, Wah-Keat Lee of Brookhaven National Laboratory, lead author Kenji Kikuchi of Tohoku University, and Souvick Chatterjee, a 2015 graduate from Virginia Tech's engineering mechanics master's program who is now a postdoctoral research scholar at the University of Illinois at Chicago.